Throughout our website you'll find details of the features that make Vaughan professional quality tools special...tools to be proud of. Balance is difficult to describe and impossible to formulate, but when a hammer's got it - you can just "feel it." A well-balanced hammer can seem to "swing itself" reducing stress on muscles and tendons. The hammer becomes an extension of arm, swinging smoothly and easily, delivering power blows almost effortlessly. Of course, not all hammers have the same feel. Obviously, a 10 oz. finishing hammer feels different than, say, a 24 oz. framer. Proper head-to-handle weight distribution is one of the key factors and Vaughan hammers have it! All Vaughan hammers are designed with our exclusive CAD/CAM system and extensively field tested, with special attention to the balance that has made Vaughan the choice of the pros. The single most important procedure in the manufacture of a Vaughan hammer is controlling the temper or degree of hardness of the head. Of course, it's important to start with the right steel. Vaughan uses only U.S. made, high carbon steel. Correct hardening is achieved by the very precise process called heat treating. 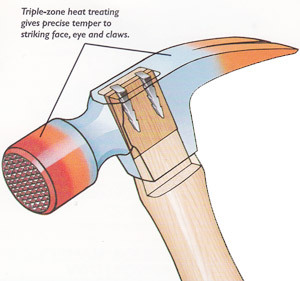 Vaughan hammers are "triple zone" heat treated, ensuring that the striking face, claws and eye each have precisely the right hardness and toughness for the different jobs they must do. The depth of the hardening on the striking face is just as important as the degree of hardness. Unfortunately, since hardness cannot be seen, it is often neglected, affecting the hammer's durability and making it a potentially dangerous tool. When the striking face is too soft, or hardness to shallow, the face can mushroom. If it's too hard it becomes brittle and chips easily. Vaughan hammers are deep hardened, an extra step to make them more durable. If the claws of a hammer were as hard as its face they could fracture under pulling forces, so we make our claws softer, but without losing toughness. Because the eye strength rather than hardness we make it even softer. Claw hammers are hardened specifically to strike common (unhardened) nails, spikes and nail sets. They should never be used to strike hardened nails or tools such as cold chisels, punches or drills. Vaughan also manufactures hammers designed and specially hardened to handle these jobs. Ball Pein hammers (left) have a larger face, and wider bevel, and are not as hard as claw hammers. They are available with hickory handles in sizes to tfit the job from 4 oz. up to 32 oz. Hand Drilling Hammers are the hammer of choice for heavy duty use with star drills, cold chisels and brick chisels. the extra-large, beveled striking face is specially hardened to perform these tasks with a greater degree of safety! Recognizing the superior shock absorbing qualities of hickory, Vaughan has used it as the standard against which all other handle materials are measured. Vaughan Steel Eagle® hammers feature Shock-Blok®, a patented, shock-absorbing hickory and rubber insert in the head. Most of the shock of hammer blows is absorbed by the Shock-Blok® plug, the rest by this hammer's unique, air cushioned grip. Vaughan fiberglass handle hammers features a patented, hollow core design to help absorb shock and give the hammer the balance and "feel" of wood. Vaughan tubular steel hammers incorporate a 4" hickory plug in the eye and the handle neck to help absorb shock and provide extra strength. Claws on Vaughan hammers are double beveled. The forged bevel provides clearance to allow claws to slip easily under nail heads close to the wood surface. A secondary, precision-ground bevel firmly grips nails of all sizes, from brads to spikes. The bevel on the striking face of Vaughan hammers reduces the chance of chipping the face with off center strikes, making the hammer safer to use. A properly crowned striking face drives nails flush without marring the wood surface. The crown acts to "automatically" correct off-center strikes, minimizing nail deflection and bending. Vaughan's professional hickory handle hammers feature an exclusive triple-wedge design with hickory wedge and two steel wedges. Together with precise moisture control in the handle, this construction ensures that the head-handle assembly remains secure. Curved claw professional hickory hammers are triple-wedged and epoxy sealed.) Vaughan fiberglass and tubular steel hammers use an epoxy-sealed steel wedge to maintain the integrity of the assembly. From hickory logs, fiberglass strands, steel bars and tubing to finished product, Vaughan controls every step in the manufacture of its hammer handles. Our sawmill in the heart of one the nation's largest hickory forests ensures a constant supply of strong, high density hickory. Vaughan makes its fiberglass handles with an exclusive process that forces extra resin into the neck section, uniting fiberglass strands and resin into a high density compound that provides extra strength without affecting the balance or resiliency of the tool. Vaughan Steel Eagle® solid steel hammers are forged of high quality, high carbon steel. Tubular steel handles feature a hickory plug that extends well down into the handle to strengthen the critical next area.